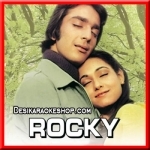 Rocky is a 1981 Bollywood film produced and directed by Sunil Dutt who also has a cameo role. The film marks the debut of Sunil Dutt's son Sanjay Dutt and stars Reena Roy, Tina Munim, Amjad Khan, Raakhee, and Shakti Kapoor. Aruna Irani received a Filmfare Nomination for Best Supporting Actress, the only nomination for the film. Shammi Kapoor plays himself, where he gets to judge dancers to the famous song "Aa Dekhe Zara," where Sanjay Dutt and Reena Roy as a pair compete against Shakti Kapoor and Tina Munim. The film was released only a four days after the death of Sunil's wife and Sanjay's mother, Nargis. The film became a "semi-hit" at the box office and the ninth highest grossing film of 1981.